A wedding is a special event and the official affirmation of a couple’s love and commitment to each other. The wedding bands are very important as well. They symbolize a token of this commitment and love. For many couples this is one of the most important aspects of the details of planning a wedding, and it could be a bit of a challenge. There are so many styles of wedding bands out there and this may be a bit confusing. However, many couples solve this issue by opting for matching wedding bands or wedding band sets. There have been many trends in the jewelry industry. Many couples prefer to match their wedding bands, and they have fun choosing the perfect style for both. It becomes an enjoyable experience. Other couples take it one-step further and will have his and hers wedding bands custom made. Custom work will include any preferences that the couple will choose, and any special engravings that are meaningful to their relationship. Some couples, even design the entire ring, with the help of an experienced jewelry designer. While this option may be a bit more costly, it is very personal, and offers a couple much satisfaction. The result is a unique look, which reflects unity. There are many styles of wedding band sets available. The designs are infinite, and the possibilities go as far as the imagination of the jewelry designers can go and even the couple’s imagination as well. There are matching bands (2 jewelry pieces) – his and hers; you may also find matching wedding sets, which includes her wedding ring and band matched to his wedding band (3 jewelry pieces), and also you will find a matching wedding set that will include an all matching wedding rings, including her wedding set, her wedding band, all matched to his wedding band – for a total of five pieces of jewelry. This last option is the most expensive of all. These days, many couples are opting to simplify things and wearing only matching wedding bands. This is the most simple and cost effective option. Finishes on matching wedding bands can range from traditional white or yellow gold, or rose gold, platinum, tungsten, copper, sterling silver, and one of the latest trends, titanium – which is a very light, but sturdy metal. You can also find a combination of these metals in a two-tone or three-tone design, such as white, yellow, and rose gold. Some matching bands include the addition of diamonds of precious stones, even birthstones. Others will include engraved designs, textures, weaving patterns, inlay patterns, or any particular engravings that the couple may choose for a customized look. Other couples are going more traditional and selecting wedding bands with religious motifs – crosses, Star of David, Celtic bands, Wiccan motifs, and many more. Handcrafted Celtic matching wedding bands are very popular, and they are handcrafted in Ireland. There are couples that have opted for more bold and creative matching wedding bands and have decided to choose tattooed wedding bands, which are a wedding band tattoo, with a custom design for the couple. This is an extreme decision, and hopefully one that lasts forever, as it may be a bit difficult to remove a tattoo. 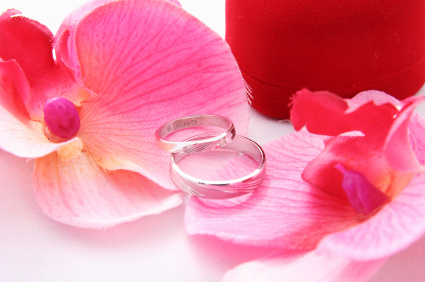 The pricing of matching wedding sets vary according to style, number of rings, size of rings (the more gold needed in the ring – for example size 13, the more it will cost), the addition of diamonds or precious stones, custom designs, engravings, type of metal, and of course brand and where the couple buys the rings. Bands, which are made from famous designers, will have an expensive tag. Buying at prestigious jewelry stores, and even regular mall jewelry stores will be more expensive than buying online. Custom work is always more expensive as well. However, there are always many sales and discounts available at mall jewelry stores since there is more competition in this area. Some independent jewelers may also offer discounts, as they have to compete with the bigger jewelry chains. However, the method that will give a couple the most options will be buying online. Online shopping will prove the most cost effective and the method that will offer most choices to look at to consider. It is also a time saver, as a couple can sit down in front of their PC and look at thousands of rings in one sitting. It may also be confusing, as the choices are immense. There are many deals online, as well as many discounts when buying his and hers wedding bands. There is a huge selection of styles and materials, and prices may even start under $50, and go up depending on the above-mentioned factors. Besides looking in stores and online, a couple can find other bargains at antique stores or pawn shops, and even at the classifieds, or Craigslist and Ebay sites. However, the possibility of finding an exact match decreases. The perfect fit is important while getting matching wedding bands. When being fitted for a wedding band, consider the time of year or season, as usually in the summer, the hands and fingers will swell, and in the winter, jewelry will be less tight. A couple can use their most comfortable rings as an example of size. They can also go to a jewelry store and most times the sales associates will offer a fitting for free, as a complementary service to their customers. It is just good business practice. There are paper or metal ring sizers that can be purchased as well, but there is no real need for that as a jewelry store staff can fit a couple for free, as previously mentioned. The type of band that a couple selects is also indicative of how well and how comfortable it will fit. There are “comfort fit” bands, which are rounded on the inside to offer a comfortable fit. This fit is truly very comfortable, and you can hardly feel the ring at times, as it does not feel as if the metal is cutting or touching the skin; it feels mostly as if it rolls easy on the finger – it is a soft and gentle fit, perfect for the delicate skin of a lady and perfect for a man to wear to work, especially if he works using his hands. If you happen to fall into a half size, it is better to choose the biggest size. You have two choices, wearing a ring guard, which can be purchased at any jewelry store, or sending the ring to be sized. Ring guards can be permanent and made of gold or metal to match the finish. They attached to the band (not recommended on a thick band) or made of plastic, which will slip into the thin band. A jeweler will be able to do any custom sizing work. When a ring is a bit bigger, the jeweler will remove gold and solder back the ring making it the perfect size. When it is smaller, the jeweler will have to add gold to make it bigger – this will be costly as gold is being added. A word of caution – some materials that are not gold cannot be sized. Intricate designs and carvings may not be able to be sized either. A jeweler may try to replicate the carving, but it will cost money. The best advice is to get the right size, and order it that way. It will save you time and money in the end. However, if you are set on wearing a particular band, such as a heirloom of matching bands that may have been in the family, the above-mentioned option is available to you. There are many designers of matching wedding sets. Some of the most popular ones are Benchmark, Dora, Solange, Chris Correia, Joel Schwab, Tacori, Triton, A.Jaffe, ArtCarved, Christian Bauer, Since1910, Ritani, Lieberfarb, Diana, Diamond Ideals, Martin Flyer, Jeff Cooper, Kirk Kara, Leigh Jay Nacht, Caro 74, Helzberg, Henri Daussi, Keepsake, Mark Schneider, Simon G Jewelry, Varna, Timeless Designs, and many more. These are some of the most popular designers, however, a couple does not have to spend tons of money, they can always find the perfect set of matching wedding bands according to their budget and taste. There is a huge inventory to choose from, and by searching online, the possibilities are just that immense. The most important issue is that the matching wedding band set that the couple chooses is a symbol of their love and commitment for each other. looking for matching wedding bands with palm tree’s its a shame that your site doesn’t show pictures of the items you offer do you have any.